In October 2002 Gillian Dyson and Andy Moss dived the museum wreck Kronprins Gustav Adolf, in the Helsinki Baltic bay. Here's Gillians account of the dive. The ship was sunk in 1788 after being captured by the Russians, and discovered in 1995. Due to the low salt content of the Baltic Sea, there is no woodworm to decay the ship's timbers, so this wreck is remarkably intact. The wreck lies at about 20 metres, and has been excavated as a significant heritage site, open to the public in 2000. We dived with NDI Watersports, Helsinki. In the late afternoon we left the harbor to navigate the splatter of islands and tight shipping lanes to the Gustav Adolf. The sea was choppy with a cross wind, and it was strange to jump in off the bow of the flat pontoon like metal dingy. We descended the line onto the wreck, into about 5 metres viz. The wreck is roped off, like a guided tour with information plaques (unfortunately in Finnish) at significant points on the ship. This sounds woosy but actually the conditions were far from perfect. The added safety of the line and the information points ensured that you didn't miss any of the more interesting details of the wreck, and could concentrate on that rather than navigation! There are intact canon, anchor, rudder, scattering canon balls, pulley blocks, and hand made timber joints to inspect. The decking is clear and you can make out sections of the ship. An excellent dive; we went round twice! As night drew in we sailed back into Helsinki, passing really close to the super ferries leaving port, and the Ice Breakers preparing for the winter. The Gustav Adolf is a modest but significant dive site. The Baltic Sea, and Helsinki's vital position hold great maritime significance for Sweden, Britain and Russia. We were really interested to learn more of Finland's maritime history at the Maritime Museum, saw some really excellent treasures, putting the Gustav Adolf's role into context. 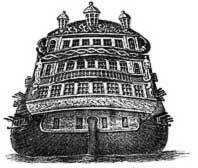 You can check the Kronprins Gustav Adolf and other Baltic maritime archeology at the National Board of Antiquities site at the link below.